I wish there were more strategy games of Starships's scope and scale. I love Civilization, I love Total War, I love Europa Universalis IV, but every time I sit down to play one of those games I can practically see sand falling through the hourglass. Cue the crazy time-travel montage where the day/night cycle progressively speeds up and suddenly I wake up and it's three weeks later, there's drool on my chin, my beard is burly and lumberjack-esque, and I've finally—finally—completed a single campaign. If I'm really lucky, I might even win. But those 30-60 hour campaigns are intimidating to me as an adult—particularly as an adult whose job is to play a lot of video games every year. Long games are great, but they're typically great for me to play once or twice. Then I, of necessity, have to move on. Sid Meier's Starships is the solution, for me at least. What Starships does is condense the turn-based Civilization feel down into a few hours, and I love it. I can sit down, play through an entire Starships game (or two! ), and still make it to bed at a reasonable hour. In my preview a few weeks back I compared Starships to a board game, albeit one that's too complex to feasibly be played with physical pieces. I stand by that comparison. You've got two layers to pay attention to: strategic and tactical. 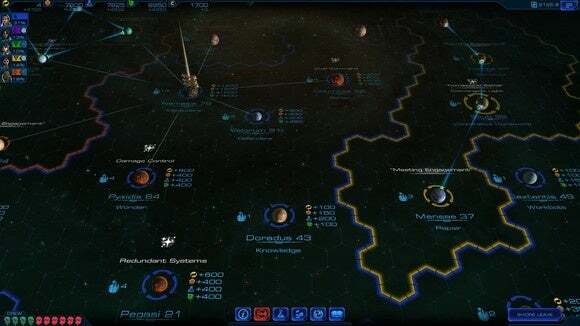 The strategic level is a galaxy map, full of planets—one of which is your faction's homeworld. 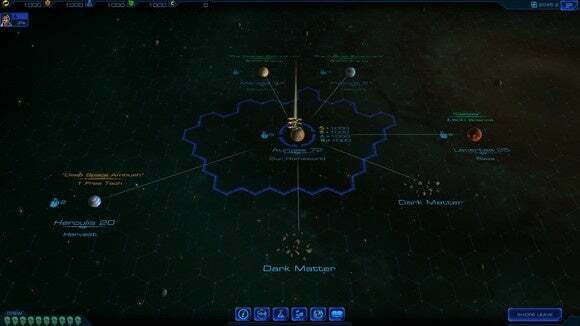 You need to capture 51 percent of these planets in order to win the game. 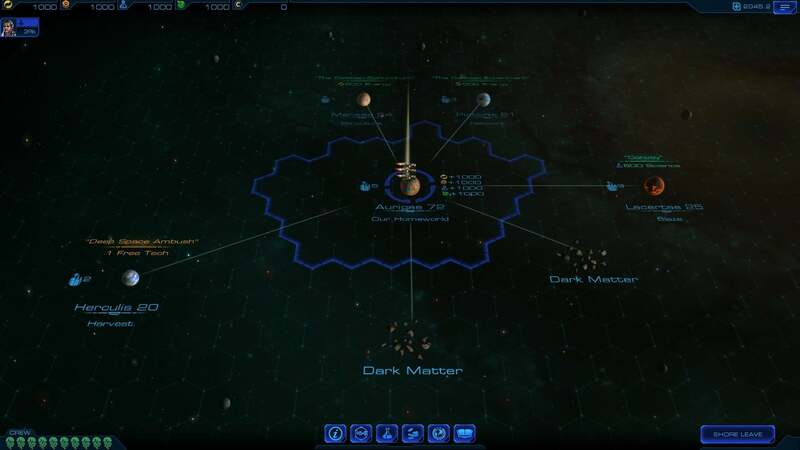 Your main tool in conquest is a single fleet of ships which you'll pilot from planet to planet. Once you arrive at a planet you'll be given the option to accept or decline a mission to help the locals—for instance, chasing off pirates. Here's where the tactical layer comes into play. Your fleet is transferred to a smaller, hexagonal grid representing local space. 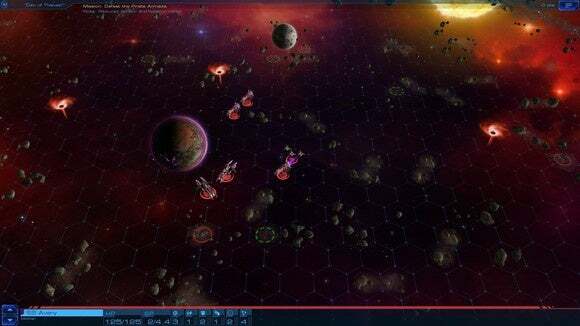 You maneuver your ships around this hexagonal grid to try and get a bead on the enemy ships, exchange shots, and use the "terrain" (asteroids, planets) to your advantage to provide cover. Defeat the pirates (or, occasionally, complete tasks on an objective-based map) and you'll gain influence with the planet. Gain four bars of influence (by completing more missions, purchasing influence with energy, or taking shore leave/ending your turn at a location) and the planet becomes part of your Federation's territory. If you capture another Federation's home territory (which is a massive battle) then you get all their territory and knock them out of the game. It might sound complicated laid out in words, but it's beautifully simple in practice. 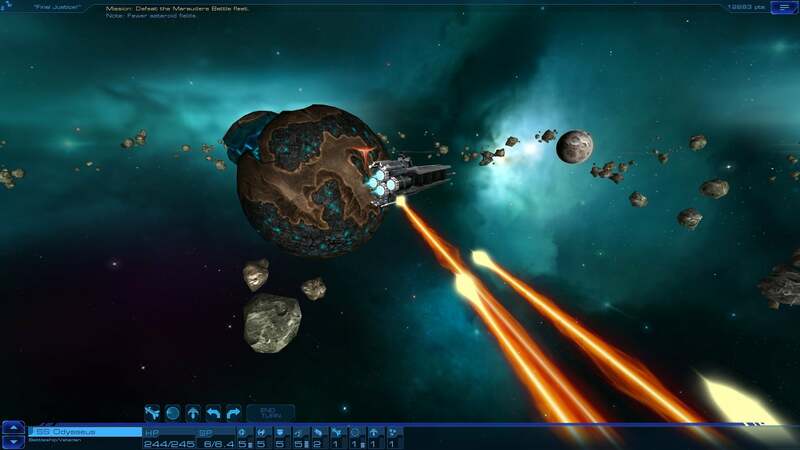 Unlike Civilization or Total War, where you might spend hours reading up on various strategies trying to get a handle on the game's inner workings, Starships is immediately accessible. You can pop in, start playing, and within one or two games understand what's going on. Which is not to say there's no depth to Starships. If Civilization is a game where depth arises from an infinite number of choices, Starships is a game where depth arises because of the rule constraints. With a limited number of systems, you're forced to come up with clever strategies by making do with what you've got. Research, for instance. In Civilization, the tech tree is always a massive, intimidating mess during your first game. There are so many choices, and you don't really know what any of them do. And what's the best strategy? To take the research penalty and get advanced tech early on, or to diversify early and often? In Starships, you still research new technologies—but there is no tech tree. There are only ten or so technologies, all available at the start, and each one has an immediate impact on your ship stats. Do you drill down on shield technology, making your shields gradually more efficient? Add better hull armor to your ships? And your ships have the same levels of customizability, though they draw from a separate pool of funds (energy). Each ship in your fleet can only fire weapons once per turn. Do you use your funds to make lots of small, underpowered ships so you can fire more times per turn? Or do you focus on two or three behemoths, knowing you'll knock out an enemy ship with each shot but you'll also take more damage if battle has to go on longer? Or do you make every ship in your fleet ultra-maneuverable, allowing for guerilla tactics within asteroid fields? But the best part is, as I said, that you don't need to know any of those answers going in to Starships—most of all because losing isn't quite as painful as it is after you've put thirty hours into a game of Civilization. If you lose in Starhips, there very well might be time for another match the same night. That means you can iterate on your own strategies quickly, getting better at the game by learning from your own mistakes instead of counting on reading other people's mistakes to make you a better player. It's that couple-of-hours scope and that feeling of personal skill growth in particular that will keep me coming back to Starships. Part of what makes games like League of Legends or Hearthstone so appealing is they present strategy gaming on a small, contained scale. Starships takes the same idea and applies it to the turn-based genre. I do have a few small knocks against Starships. For one, it could use a major upgrade in the art/UI department. Even more so than Civilization: Beyond Earth, the UI elements in Starships look...ugly. 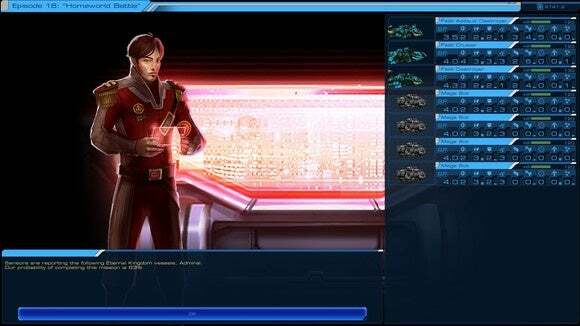 It looks like menu design from ten or fifteen years ago—definitely not the level of production I'd expect out of Firaxis. This is far from the company's peak (which I'd pinpoint as the minimalist design used in Civilization V). It's bad. The typeface, the colors, the use of empty space, it's just not very attractive. The maps themselves are better, though you're bound to notice some low-res textures on occasion. I'm not sure if that's because it's a budget title, because of the short time-scale this was made in, or because it needs to run on both PCs and tablets. None of those answers are great. The game should look better than it does. There are also some quirks with the game's win/loss predictions. Each mission, you can ask the game for details and receive a "You have X percent chance of success." These predictions are apparently pulled at random out of a hat. I've had missions tell me I had a 40 percent chance of winning, only to have me win the battle in the first turn. I'm not that good at the game. Starships probably isn't going to inspire the same sort of love as Civilization. I don't think we're going to look at this title in a year and see people with thousands of hours logged, or see people poring over strategies on forums. It's got depth to pore over, but I just don't know if it has the staying power of Civilization with its near-infinite strategies. But maybe. There's certainly precedent in the board game space, with titles like Settlers of Catan for instance. And that's really the scale Starships should be measured on, because it's one of the few times I've seen something so identifiably board game-like that nevertheless could only exist as a digital title. And I like that. I'd like to see more of it! If nothing else, Starships proves we can have a satisfying turn-based game without the baggage of a thirty-hour campaign. Starships condenses Sid Meier's knack for turn-based strategy into a short, two-to-five hour burst of board game-esque tactics that's as satisfying as it is approachable.